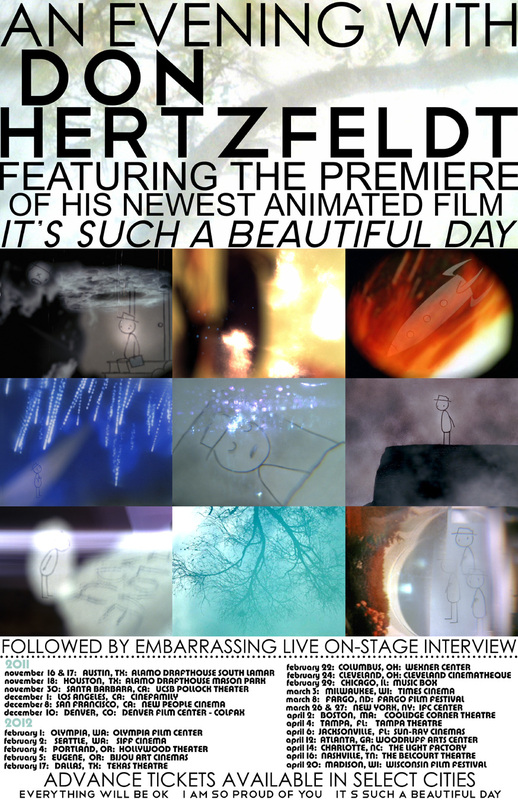 Don Hertzfeldt, an Oscar-nominated indie animator with a huge nationwide following, will make a special in-person appearance on Friday, February 24, at 7:30 pm at the Cleveland Institute of Art Cinematheque, 11141 East Boulevard in University Circle. “An Evening with Don Hertzfeldt” will include the Cleveland premiere of Hertzfeldt’s latest work, the 23-min. It’s Such A Beautiful Day, the third and final part of his “Bill” trilogy. (A character named Bill stars in all three movies.) The other two parts of the trilogy, Everything Will Be Ok (2006) and I Am So Proud Of You (2008), another Cleveland premiere, also will be shown, along with other Hertzfeldt short films. Admission to “An Evening with Don Hertzfeldt” is $12; Cinematheque members and Cleveland Institute of Art I.D. holders $9; ages 25 & under $7 (with proof of age). Advance $12 and $9 tickets can be purchased online at www.brownpapertickets.com/event/216679. $7 tickets will be sold only at the door -- after 6:45 pm on February 24.